It&apos;s highly likely that if you go to a summer festival in North Carolina, you&apos;ll experience the craze that is Carolina beach music! There&apos;s no denying that the genre is hot in the Carolinas. With the fun of the live music and easy-to-shag-to grooves, Carolina beach music concerts are great shows for visitors to hit and have a great time at. You&apos;re bound to hear some tunes you know. Some beach music chart-topping artists include Jimmy Buffett, Alabama, Al Green, Ray Charles and Van Morrison. 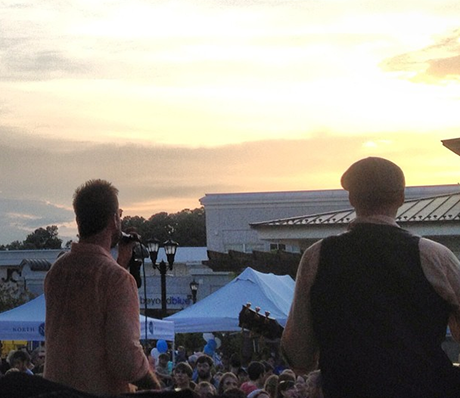 And if you&apos;re coming to Greater Raleigh this summer, catching a Carolina beach music concert is a breeze. If you haven&apos;t experienced the craze that is Carolina beach music, you must experience a concert in the area. If you&apos;re a fan of the genre, you must experience a concert in the area as well! Throughout the summer (until Aug. 15), North Hills is putting on beach music concerts in its town square-like Commons area every Thurs. night. 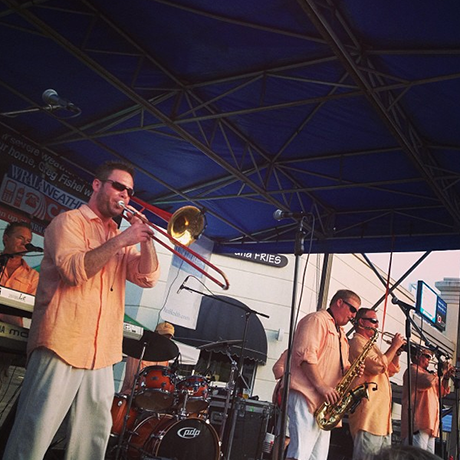 This series of concerts, called the Midtown Beach Music Series, undeniably rocks the area. I hit the event last Thurs. and had a blast listening to Band of Oz, the local Raleigh band that played that night. North Hills, on its own and even without a concert going on, is a blast to visit. The original North Hills shopping center was built in 1967 as the "first two-story mall" between Washington, D.C., and Atlanta. Since &apos;67, the shopping center has grown way beyond just a shopping center. North Hills is now a gigantic area with millions of square feet of shops, restaurants, entertainment venues, residencies, offices and more. More than 130 shops and restaurants and 81 locally-owned shops and restaurants are all nestled in the stylish and classy heart of the Midtown Raleigh district. 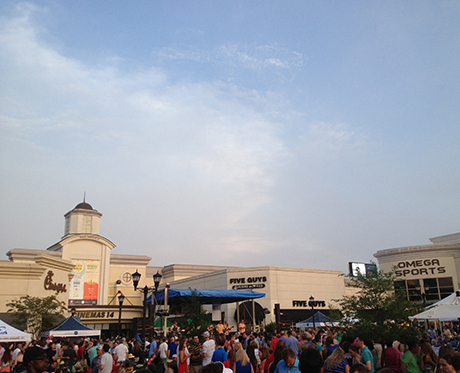 I love The Commons, the area of North Hills where the Midtown Beach Music Series takes place, and to say, "North Hills goes all out for the concerts in the area," is an understatement. Finding a place to park Thurs. night was a breeze with the numerous and visible parking signs around the area. Just arriving to the area alone is an experience, as the beautiful Carolina sky over the elegant buildings makes for a great sight. I&apos;d suggest to get to North Hills early for lunch. If you&apos;re on vacation looking for a relaxing, care-free afternoon, dine at one of the many restaurants in the area. Mura at North Hills, Fox and Hound Pub & Grille, Five Guys Famous Burgers & Fries and many, many other restaurants offer delicious dining. Fuel up for a night of dancing! And when you&apos;re ready for dinner after a night of dancing, give one of the other restaurants a try. The Midtown Beach Music Series concerts start at 6pm, right when locals and families are going out and looking for a great time. So the party is really happening by that time. From families, to young professionals and more, everyone has a great time and especially when the music starts. The event is truly an outdoor party and a great social event. The Commons area is roped off, so drinks are served in the outdoor area. From domestic beers to cocktails and wine, there are plenty of drink options for the adults. With Ben & Jerry&apos;s Ice Cream, Five Guys Famous Burgers & Fries and more right in The Commons, kids have plenty of food and beverage options as well. I definitely suggest bringing a lawn chair if you can! Get to the show early and get a great spot, so you can sit down and relax if you need a break from dancing and doing the ever-so-popular beach music dance known as the shag. Now to the music: Band of Oz and Carolina beach music bands like North Tower, The Fantastic Shakers, The Craig Woolard Band and more are playing at the concerts. And North Hills does a great job of picking great, very talented and entertaining bands to play. Check out a concert any Thurs. during the summer and you&apos;re set for some quality Carolina beach music. I also find the sound system to be top-notch (not too loud for the kids and not too low for Music Maniacs who love to rock). From the sounds of the horn section, to the round, clean guitar sounds, tight vocal harmonies and more, the sound system picks up the timbres to perfection. 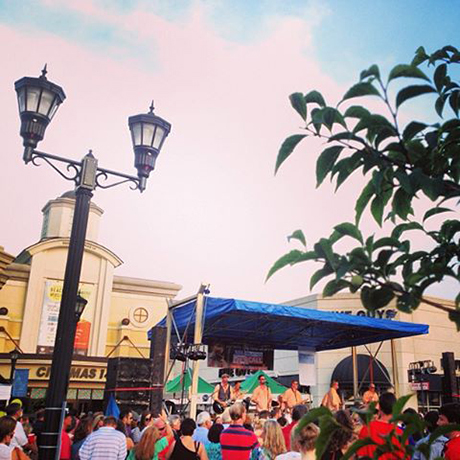 So if you&apos;re up for an entertaining night of music, food, drink, dancing and shagging, check out the Midtown Beach Music Series at North Hills! The shows don&apos;t stop this summer. With the most live music out of any destination in N.C., you&apos;re bound to find your groove in Greater Raleigh. Take in a summer of wall-to-wall music! The band pictured throughout this blog is Band of Oz from Raleigh!